actresses - Hot babes - They're Babes - and they're hot! Julie Benz played Angel’s “sire” Darla in Buffy the Vampire Slayer, Dexter’s wife in Dexter and most recently Stephanie Powell in the hit tv show No Ordinary Family. A very beautiful woman who, like a good wine, seems to get better looking as she gets older. Bodices seem to suit the likes of Penelope Cruz, though I’m not sure if the cutlasses do it for me or not .. 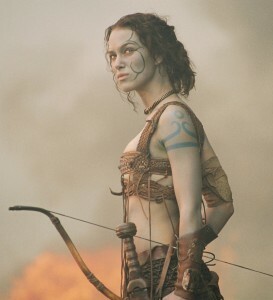 This might be a slightly “old” shot of Keira Knightly from King Arthur, but it still captures her almost feral beauty.